To celebrate RHS Chelsea Flower Show week, we have a fantastic competition where you can win a year's subscription to Gardener's World Magazine! To enter, simply like, share and comment 'Cosyfeet' on our Facebook competition post. All entries must be submitted by Wednesday 31st May so be quick! Click here to enter now. Good luck! For full terms and conditions, please see below. 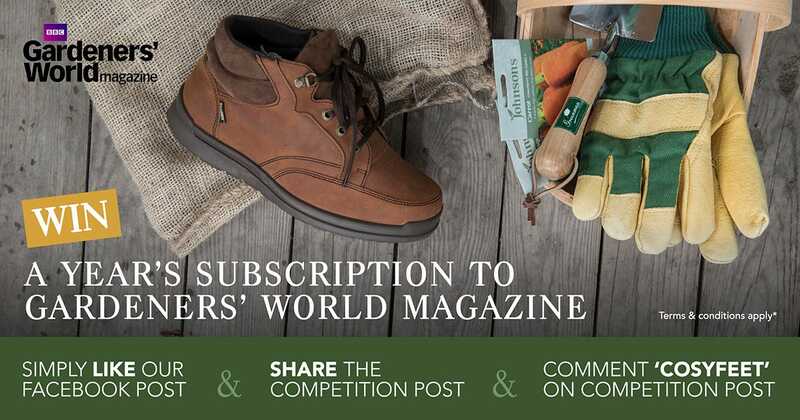 To be entered into the prize draw to win a 12 month magazine subscription to Gardeners' World Magazine, simply visit our Facebook page and like our competition post, share our competition post and comment ‘Cosyfeet’ on our competition post. Note: You must complete all 3 actions (like, share and comment ‘Cosyfeet’) to qualify. Click here to visit our Facebook page. The closing date for entries is 11.59pm on Wednesday 31st May 2017. No entries will be accepted after this time. One winner will be selected at random and will be notified by message on Facebook. The judge's decision is final. Prize cannot be exchanged for a cash alternative. By submitting an entry into our competition you are consenting to us featuring your name on our website and Facebook page. We reserve the right to withdraw this prize draw at any time.